She was a Dynasty diva and a smash hit for girls in the 1990s. 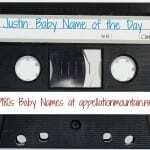 But today Shan has asked that we talk about Alexis for a boy as our Baby Name of the Day. Let’s get this out of the way: Alexis started out masculine. He’s part of the Alex family, along with Alexander, Alexandra and all of their kith and kin. In Greek alexo means to defend. Alexis, Alexios, Alexius, Alexei, and Aleksey are all close equivalents. The Greek sculptor Alexis was active somewhere between 400 and 300 BC. 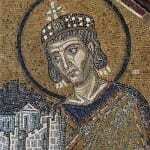 Alexis of Edessa was an Eastern saint later embraced by the Western church. Legend has it that while he lived in Mesopotamia, he was born in Rome. The name was worn by five Byzantine emperors, from the eleventh to thirteenth centuries. Russian royals liked this one, too, typically as Alexei or Aleksey, especially from the 1600s to 1800s. He never made much headway in the English-speaking world. That’s not wildly surprising. New immigrants tended to give their children American names. Plus, Alexander might be a favorite today, but he was relatively underused throughout most of twentieth century, hovering in the 100s and 200s. When we did hear the name, it was foreign. Alexis barely peeked into Top 1000 in the nineteenth century. One explanation for his brief appearance? Grand Duke Alexei of Russia’s goodwill tour of the US took place in 1871 and 1872. 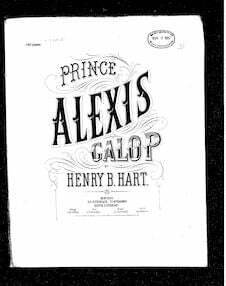 Band leader Henry B. Hart recorded The Prince Alexis Galop in his honor. There was also Prince Alexis Karageorgevich, heir to the Serbian throne, who courted more than one American heiress just a few years later. By the 1930s, the name was seldom heard. Girls started borrowing Alexis as early as the 1940s and she entered the girls’ Top 1000 in 1943. Actress Alexis Smith flourished in the 1940s and 40s. Born Gladys Smith in British Columbia, her big break was starring opposite Errol Flynn in 1941’s Dive Bomber. In the 1970s, she earned a Tony Award for her Broadway debut. Smith was active into the 1990s. I couldn’t find an explanation for how Gladys became Alexis, but Gladys was an ordinary name in her day – in fact, actress Mary Pickford was also born Gladys Smith. Many of the Alex- names were gaining in the second half of the twentieth century. Conventional wisdom is that once a name catches on for girls, it is forgotten for boys. The truth is more complicated. Alexis caught on in a small way for boys in the 1960s and 70s, peaking at #120 in 1997. In the 1980s, Dynasty established Alexis as a glittering choice for girls, and she’d reach the US Top Ten in the late 1990s. Today a handful of men answer to the name, like Joss Whedon player Alexis Denisof. French and Spanish speakers see Alexis as masculine, too. Can you give the name to an American boy today? Maybe. He can always answer to Alex instead. At #242 in 2011, Alexis is not unheard for boys. Plus, as Alexis fades for girls, it might just have a chance at feeling fresh for a boy again. No surprise here, I’ve always loved Alexis on a boy. The only thing keeping me from using it [or other Alex-/Aleks- names] as a first name for my son, is that I don’t want an “Alex”! Alexis is wildly popular for boys in Quebec; it’s been in the top ten for some time now, and Alexandre and Alex aren’t far behind, which means there are loads of little Alexes running around these parts. I prefer the French and Spanish pronunciations of Alexis to the English, but I’d be happy to see Alexis re-emerge as a masculine name in the English-speaking world one day. I grew up with a boy Alexis. He was Hispanic. My aunt is Alexis, too. She was born in 1947, I think, and named for her father, Alex, who died while her mom was pregnant with her. I also have a second cousin named Alexis, who was born in 1983-ish.